In the winter and fall, the weather forecasters often state that we're having 'bad weather'. But isn't it up to us to decide if the whether is bad or good? Personally I think the weather outside is 'weather'. That's also a line in one of my favorite movies Forgetting Sarah Marshall. The weather changes we experience in California really aren't too extreme. But usually by the time it gets cooler or warmer and stays that way... I'm ready for it. Our hot weather is nearing an end (at least we think it is) and I'm ready to start wearing long pants and sweaters. Woo hoo! When the weather cools off I also tend to stay indoors and craft. Look out house and clothes... there's no telling how I will alter you in the next few months. Weather is the theme of my latest Etsy Treasury. 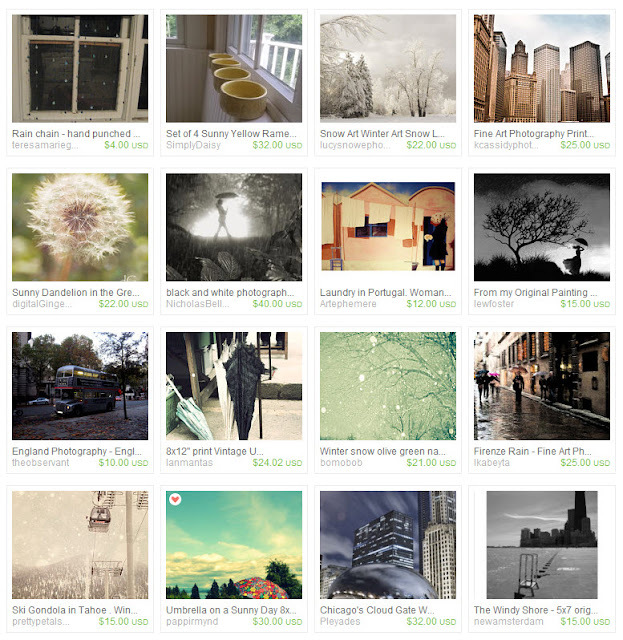 It was REALLY easy to find great art to include in this treasury. I'm with you on that Bevin. The shorter daylight hours are the hardest part of 'winter' for me too!